You’re probably here because you have completed your blockchain application. Congrats! You also may be concerned that your application won’t perform efficiently and aren’t sure how to test it. Welcome to the fifth in a series of developer patterns that teach you how to get started creating a blockchain application using Hyperledger Fabric SDK. 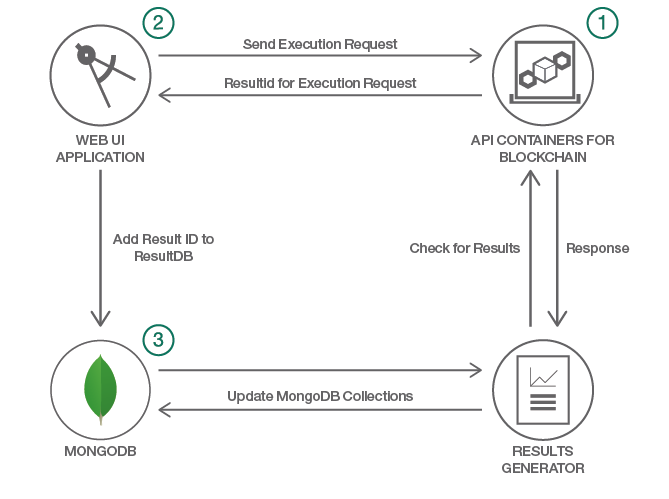 Now that you know how to create and scale the network, you’re ready to learn how to load test your blockchain application by submitting a large number of enroll, invoke, and query requests then viewing the results in MongoDB. Developers are increasingly building blockchain applications. And businesses are innovating the way they operationalize their processes and are incorporating blockchain. Consider how car sales and leases will be managed in the future, or how you may call your next Uber with blockchain. These applications are requiring networks with more participants and assets to manage. I’m sure you’re wondering how we can ensure that the network scales and supports the growing volume without bringing the entire network down. Performance and scalability for production applications should be top of mind for any developer. This pattern is the continuation of the “Integrate RabbitMQ and Redis Cluster with a blockchain network” pattern. Here, we will run Java™ programs to load test our blockchain network. In other words: We will send a request to the blockchain network and check for the results. MongoDB is used to track statistics for the load testing. Create and start the blockchain application. View the load testing results in MongoDB. IBM Code pattern Learn how to create your first blockchain network using Hyperledger Composer. Medium.com Integrate your blockchain with anything using Hyperledger Composer and NodeRed. Blockchain Unleashed Explore blog posts that cover Hyperledger Fabric. IBM Code pattern Learn how to create a to-do list app using blockchain. IBM Government Industry Blog Read Hyperledger Composer: accelerating blockchain time to value. Blockchain Unleashed Create a blockchain app to display and interact with a network through a web interface.